Isabel’s baby sister Rebekah is getting all the attention lately, and Isabel is tired of it. She’s acting out, talking back and disobeying Mama. If she could see more of her friend Tara next door, or if Daddy didn’t have to work so much, maybe things wouldn’t be so bad-but Mama thinks Tara is a bad influence, and Daddy’s job takes him out of town for days at a time. Mama has no idea how hard it is for Isabel to make new friends at school. Every day Isabel has to walk past Alicia and the other pink-and-purple girls with their lavender pencils and matching barrettes, and she just know they’re talking about her the moment her back is turned. To top it all off, Ben, the awkward son of one of the women from Mama’s cancer support group, has transferred to Isabel’s school- and he’s in her class. When the teacher asks her to show him around, Isabel ends up in a fight with Alicia. What hope does Isabel have for being accepted into the pink-and-purple girls’ group now? When Mama trusts Isabel to look after the baby for a few minutes Isabel tells her little sister just what she’s thinking. And soon she finds the courage to tell her mother everything about how she’s been feeling. What was your first experience with Isabel’s character? I knew a little girl Isabel’s age who was very, very angry. She seemed to have a sweet family, so I wondered why she was so angry at the world. I learned that her mother had had cancer a few years before I met her, and I wondered if the illness might have something to do with the anger. Was her anger masking fear and confusion over that traumatic experience? The story grew from there. What did you learn about yourself as a writer while creating this book? I don’t write in a very linear fashion. I jump from scene to scene and go back and forth, back and forth in my revision process. With this novel, I learned that it pays to write a full draft before doing any polishing. This seems like a very simple lesson, but it’s one that’s taken me awhile to digest. Starting with a full draft gives you a complete view of where your story might go, even if it turns out to be wrong. Being wrong is okay----it can lead you to the right road in the end. I’m an intuitive writer. I like to feel my way through a piece, and I will probably still go back and forth in my work, but I’m learning that planning can be helpful. In my next novel I’m going to try to think more consciously about plot from the beginning of the process. Which writers and/or books have most influenced you as a writer? Though I’m not a poet, I’ve been heavily influenced by poetry. One of my writing instructors in college (Robert Kirkpatrick) was a poet, and he taught me that each word should be carefully considered and absolutely necessary. I was never a wordy writer, but as his student, my writing became even more spare. Some of my favorite poets are Dylan Thomas, Pablo Neruda, and Rita Dove. I also learned a great deal from my instructors at Vermont College: Carolyn Coman, Brock Cole, Norma Fox Mazer and Sharon Darrow. Describe Isabel’s feelings toward “that baby.” Are her feelings typical of most big sisters or is there more going on here? Have you ever felt similar toward a sibling? What did you do with those feelings? What changes have the family faced recently? What changes have you had to deal with in your family or at school? What is the hardest thing about change? Is there anything good about it? At the support group the big haired lady made the women imagine, “..if you could have a day to do anything you wanted, what would you do?” (p. 32) What would YOU do? Do kids and adults ever have similar daydreams? Why is Isabel having such trouble getting along with the girls at school? Is she partially to blame for not fitting in or is it all that Alicia’s fault? Why do a few kids seem to hold all the power over friendships in a classroom? Why are shoes so important? What details are important at your school? Isa has a large imagination. What types of things does she dream up? What are your favorite things to imagine? Is imagination important in school? What about in life? Is it better to be smart or imaginative? What makes you say so? After the field trip Isabel accepts a ride home with Tara. What happens? How would your parents react in this situation? Have you ever been lost or missing? Courtney invites Isabel to her birthday but Isa is afraid that she’ll change her mind. Why? Do boys and girls have different kinds of conflicts? Why is Isabel worried about showing Ben around the school? Is she right to worry about it? Mama tells Isabel that, “If that’s the way they act, they aren’t really your friends.” (p.88) Who does act like Isabel’s friend at school and home? Why are things not so simple for Isa? Does everyone need a friend? How do you know if someone is truly your friend or not? 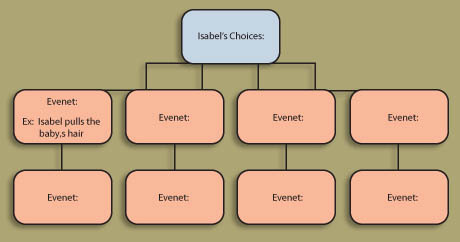 How has Isabel changed over the novel? What has she learned about herself and her family? What mistakes did she make? What mistakes did others make? Predict what you think the rest of the school year will be like for Isa. Will she become friends with Courtney? Do you think Alicia and Isa will have another fight? What about Ben? What will happen with him? Write at least three journal entries as you read the novel as if you were Isa. Describe what is happening and how you feel about it. Plan an imaginary birthday party. Figure out how much it will cost to buy everything you need for refreshments, activities, and entertainment. Use advertisements or catalogs to cut out pictures and show prices. Add up the entire cost. Then, figure out if you can host the party for half of that amount by using your creativity. Isa learns about fire safety on a field trip and creates an escape plan for her family. Create one for your own family and talk about what to do during an emergency. This guide was created by Tracie Vaughn Zimmer, a reading specialist and childrens author. Visit her website to find hundreds of guides to childrens literature.